Below is a post originally created December 7, 2012 by our friend/fellow patriot, Grumpy Elder which I thought was worth sharing with you. National Archives–Alaska Region, Anchorage, Alaska, Records of Naval Districts and Shore Establishments…. 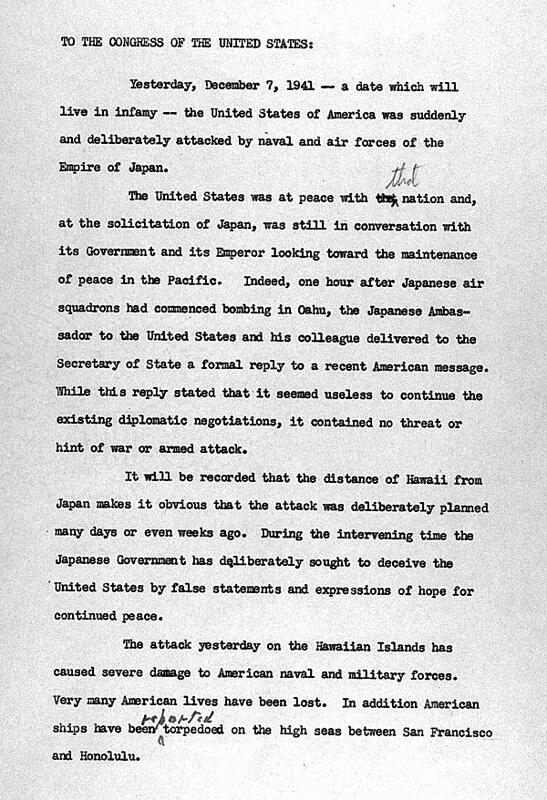 President Roosevelt’s famous “Day of Infamy” speech was a call to arms. One day after the attack, he expressed outrage at Japan and confidence in the “inevitable triumph” of the United States. 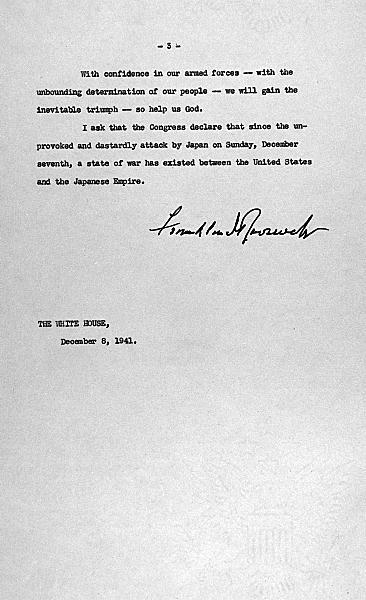 On December 8 the United States declared war against Japan; on December 11 Germany and Italy declared war against the United States. 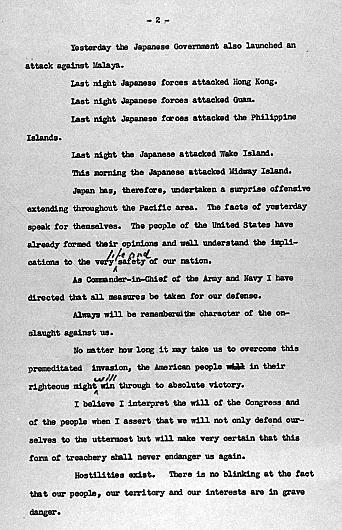 You can find the rest of FDR’s Original Address here. He didn’t have a teleprompter. Time has taken it’s toll, there are relatively few Pearl Harbor or World War II Veterans still with us. If you happen to know one, today might be a good day to take them out to dinner and show your appreciation for America’s Greatest Generation. Listen to their stories. write them down and save them, those people were there. It’s only a matter of time before before revisionist historians begin to twist the facts to fit a political or social agenda. The men and women who served under the American flag during World War II saved the entire world from becoming part of a massive fascist dictatorship controlled by Germany and the Empire of Japan. Today the globe faces a new attempt by various factions to bring it under a Global Dictatorship. The United Nations sees itself becoming the center of a One World Government with dictatorial powers based loosely on the Old Soviet Union’s Communist Model. Islamic Radicals want a return to Islam’s Golden Age when they controlled all of the Middle East, much of Southern and Eastern Europe, most of India as well as Eurasia. The difference is now they want to dominate all of Europe and the United States as well. Sadly, many of our elected officials don’t see either the United Nations or Islam as a threat. It almost looks like some of them see a role for themselves in a one world government. They’re easy to spot, they’re the ones willing to hand over our sovereignty to the UN a little at a time, undermining our Constitution in the process..